But things don't stay quiet for long. Percy soon discovers there is trouble at Camp Half-Blood: The magical borders which protect Half-Blood Hill have been poisoned by a mysterious enemy, and the only safe haven for demigods is on the verge of being overrun by mythological monsters. 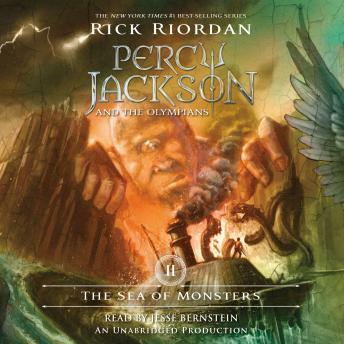 To save the camp, Percy needs the help of his best friend, Grover, who has been taken prisoner by the Cyclops Polyphemus on an island somewhere in the Sea of Monsters--the dangerous waters Greek heroes have sailed for millenia--only today, the Sea of Monsters goes by a new name...the Bermuda Triangle. Now Percy and his friends--Grover, Annabeth, and Tyson--must retrieve the Golden Fleece from the Island of the Cyclopes by the end of the summer or Camp Half-Blood will be destroyed. But first, Percy will learn a stunning new secret about his family--one that makes him question whether being claimed as Poseidon's son is an honor or simply a cruel joke. Book 1 was only OK for me but since Book 2 was just sitting there on Hoopla, I thought I would give it a try. I liked it a bit better than Book 1. It seemed to move along at a swifter clip and Percy is growing up a little. After all, he’s gotten to use his sword (Riptide) a few times and beaten back several monsters. After another boring year at a regular school, he returns to the Half Blood training camp for the summer. There he’s surprised to find out that he has to share his living quarters with Tyson, who’s a big cyclops kid with some mental challenges. Percy spends his time being embarrassed by this big one-eyed kid that follows him around. While Percy doesn’t tease him, several other kids tease one or both of them. I really like that we have this character and that Percy has to figure out how to live with him. Pretty soon, there is a quest! A quest to save the camp! But Percy isn’t the one chosen to go on it. Alas, that honor falls to the combative Clarice, a daughter of Aires. Yet the god Hermes might have other plans for Percy and pretty soon he, Annabeth, and Tyson are on their way to save Grover (who is currently on some unnamed island in drag trying to avoid getting married or eaten). While there were plenty of moments that made me laugh, there were also those moments were I expected more emotion or reaction from Percy. Once again, there’s the death of a character that means a lot to Percy and yet he doesn’t really put a lot of thought into it, not any tears, no grieving. So it’s hard for me to get fully sucked into a tale that doesn’t take itself seriously. Even if the author knows that all will turn out OK, the characters don’t. I did like that the kids are getting a little older and Percy has started to notice the first niggling of some deeper emotion for Annabeth. I’m not sure if Grover will ever get a chance to grow up though. He’s pretty much just comic relief in this story. Tyson becomes the real shining star, teaching not only Percy but some of the other kids that different isn’t so bad. Tyson has different gifts than most of the kids, and in some of them he’s quite the genius. Annabeth is a bit prejudiced towards cyclops in general due to a past bad experience. She has to face this and learn to shelve it because Tyson isn’t a jerk. All told, it was fun and I liked it better than Book 1. Especially those Party Ponies at the end. 4/5 stars. The Narration: Jesse Bernstein continues to do great with the voices. He’s got the perfect Percy voice and his female voices are dead on. I really liked his combative voice for Clarice. All of his characters are distinct and his pacing is good. 5/5 stars. This book was amazing!I love the narrators voice.It sounds just like all the characters in the book!I love the book so much.The book is filled with so much action,drama,love,and more!I can't wait to read the Titian's Curse and the rest of the whole Percy Jackson series! This book is the best book I ever heard in the history of time. He say Rick rigor dans name wrong but he is a good reader and it is a good book!